We already have winners of the First Calar Alto Competition on Astrophotography and time-lapse. 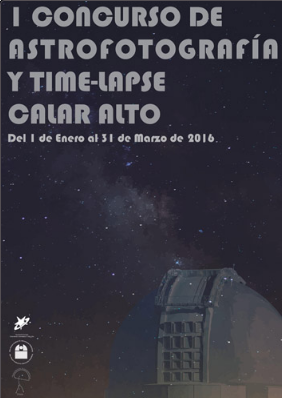 We already have the winners of the First Calar Alto Competition on Astrophotography and Time-Lapse. The quality of the presented works has been very high, and the final decision was not easy to take. In any case, we want to thank all the participants. and see them back again on the next competition. A group of German astronomers found three objects from Calar Alto facilities and wanted to pay tribute to the chefs that worked at the Observatory. The International Astronomical Union, a body responsible for naming astronomical objects, has accepted the proposal from astronomers Felix Hormuth, Matthias Busch and Alexandra Busch, and has named officially asteroids 2001ME5, 2001MO2 and 2009CL4 as (124143) Joséluiscorral, (213269) Ángelbarbero and (246759) Elviracheca respectively. The three German astronomers have wanted to pay a tribute to the chefs that worked at the Observatory until March 2014. The asteroids, which their designation is published in the international publication Minor Planet Circular, were found at Calar Alto facilities, and their discoverers proposed the names in order to pay a tribute to the former Calar Alto workers as, following their words, “from the kitchen and the heart of the observatory, they contributed in a very significant way for the scientific work to be achieved in the best conditions”. The researchers highlight the great professionalism of José Luis Corral, Ángel Barbero and Elvira Checa.